We love things old and new. That’s why we buy, sell, trade things like vinyl and VHS tapes. We fill our shelves with items that can’t be found at your everyday department store. We geek out over limited edition. We swoon at the sight of the vintage and the hard to find. We reach maximum nostalgia levels when we spot something retro. That’s why we are so excited to launch our time travel displays for May. 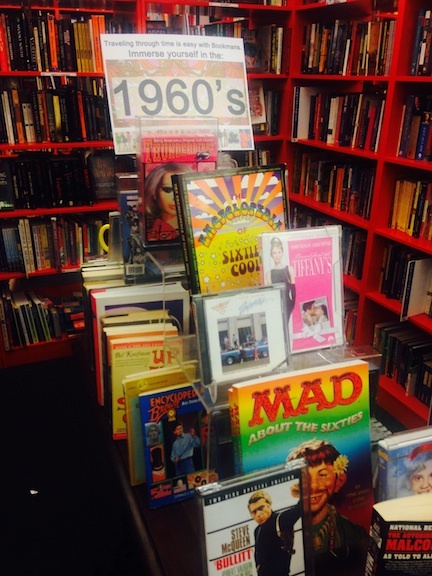 Bookmans Flagstaff takes you through time to admire the books, movies and music of yesteryear. 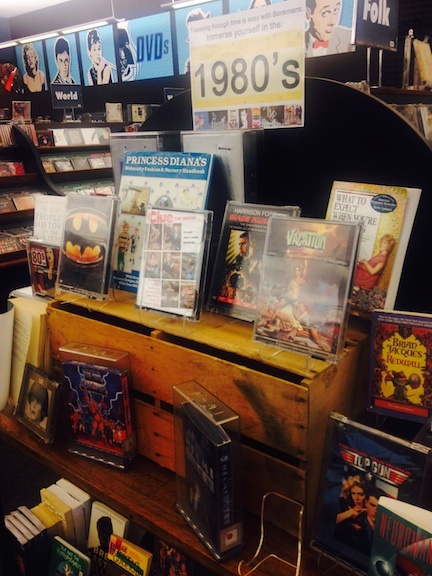 Time travel pop culture with Bookmans. There are plenty of geek-worthy decades, but to keep this post from turning into a novel we highlight two of our favorites. The 1960s. Hello millennials, the psychedelic 60s are calling you and they’re telling you to put down the selfie stick, position a flower in your hair and enjoy some of the most influential music known to man. Artist like The Beatles, The Rolling Stones, Bob Dylan and Janis Joplin contributed to this iconic decade’s unique sound. But the 60s weren’t just hippies and dead heads. No. We also had class acts like Breakfast at Tiffany’s, terrifying thrillers like Rosemary’s Baby and a charming musical of a free spirited nun in training finding love and home among the Von Trapp children and their handsome widowed father in The Sound of Music. Who didn’t cry when Captain Georg Von Trapp sang Edelweiss before fleeing his homeland for the states. All the feels! The 1980s. We know. We know the 80s weren’t exactly the most flattering what with the giant hair, ridiculous aerobics outfits worn outside of the gym and that dark time when Cory Feldman cosplayed as Michael Jackson for … like, a whole year. Nonsensical fashion choices aside, the 80s were rad. Groundbreaking novels like Margret Atwood’s The Handmaids Tale made their debut in this underrated decade. Alan Moore’s epic graphic novel Watchmen was first published in 1985. Plus we saw great films written and directed by the talented story teller John Hughs, who created such iconic movies as The Breakfast Club where we fell in love with a brain, an athlete, a basket case, a princess and a criminal. Remember David Hasselhoffs farewell to the decade and the cold war when he danced on top of the Berlin Wall? Classic Hasselhoff. The 80s were down right cool. Even with all the neon and perms, one has to admire the courage it took to rock a pair of parachute pants. You may not have a DeLorean or a Tardis but you can still travel through time by enjoying some of the amazing entertainment past generations produced. Stop in Bookmans Flagstaff and check out the cool displays celebrating the past starting with the 1940s and continuing through the 90s. Enjoy a classic film at our Free Friday Night Classic movie screenings. The third Friday of every month we ask Bookmans patrons to join us for a classic film. * Bookmans can not guarantee stock. If you are interested in a certain item mentioned in this post please feel free to call your local Bookmans and a staff member will be happy to assist you.